Craig Revel Horwood is best known as the fab-u-lous judge on BBC’s Strictly Come Dancing, but his latest project as Director and Choreographer of the divine musical comedy “Sister Act” should fast become his most notable work as this production is absolutely heavenly. 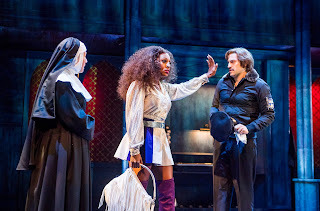 "This diva's got a secret...and it's nun of your business"
Starring Alexandra Burke, fresh from her run as Rachel in The Bodyguard UK tour, Joe Vetch and Sarah Goggin, this tour of Sister Act brings an array of actor-musos to the stage in spectacular fashion. Each character shines, not only as a singer, dancer and actor, but as a musician too. The wonderful selection of musical instruments, ranging from banjos to flutes to accordions and beyond, is seamlessly woven into this show and adds a fantastic new dimension to the musicality of the piece. Burke shines in the role of Deloris Van Cartier (a.k.a. Sister Mary Clarence). 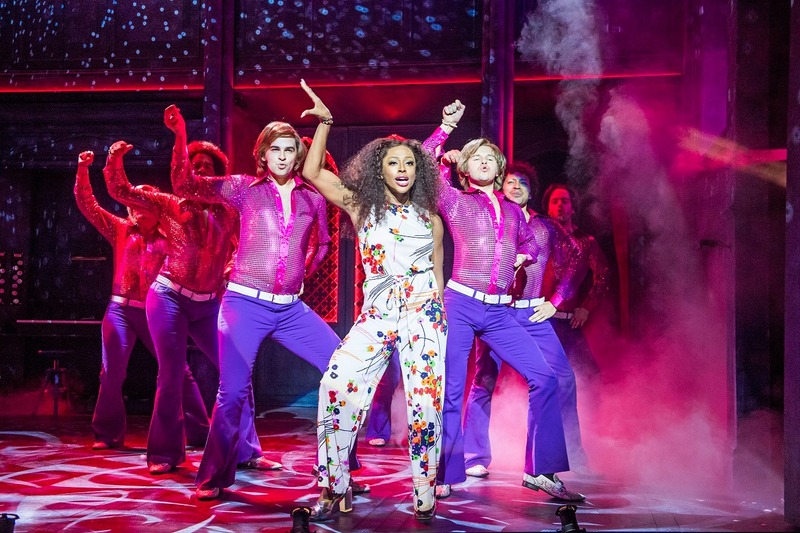 Not only is she a sensational vocalist, but she is a fabulous actress with wonderful comic timing to fit this sassy and larger-than-life role. As expected, she sang the roof off the building and earned her standing ovation at curtain call. The entire supporting cast are equally as funny in their own unique ways. Who would ever have thought hearing a dozen nuns singing hymns painfully off-key could be so funny? 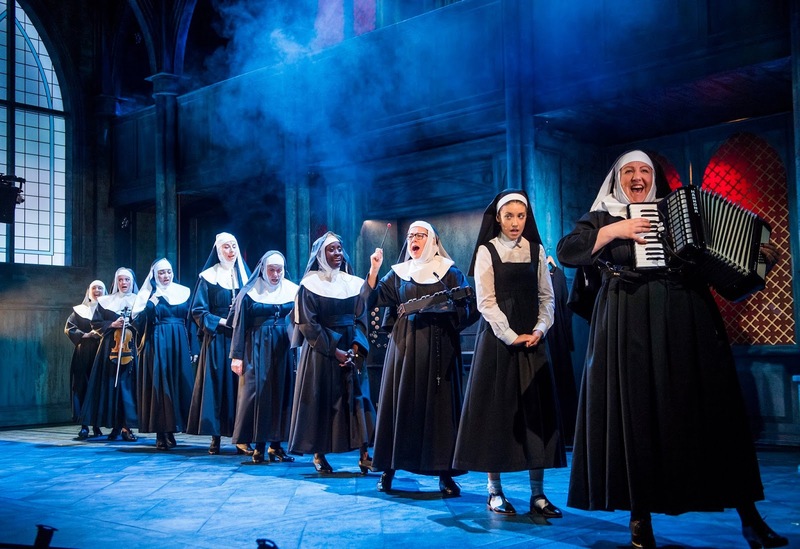 Each nun adds something new to the ensemble with a recognisable character trait without being clichéd. This show is all about the female cast. Sarah Goggin as the young, postulant nun Sister Mary Robert is small, but mighty. She’s a pint-sized powerhouse with outstanding potential for her future career. One to watch, folks! 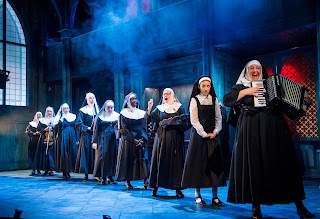 Susannah Van Den Berg as Sister Mary Patrick is another outstanding vocalist from the cast with soprano notes that would make any prima-donna jealous. She was a true joy to watch. Be That Guy” as he accompanied himself on the acoustic guitar pining for Deloris. As the not-so-gallant Three Musketeers of the show – TJ, Joey and Pablo – are Sandy Grigelis, Samuel Morgan-Grahame and Ricky Rojas respectively. These three are a concoction of comedy gold; bouncing off each other’s humour and pushing boundaries together. “Lady In The Long Black Dress” had the entire audience in stitches. This show is elevated by its sensational lighting – the best in any show I’ve seen since my last visit to Wicked at the Apollo Victoria. The small and slight changes to the warmth of the lighting made a huge impact and really aided scene changes with a relatively static set, but for the most part the lighting is big, bold and bright. The colourful backdrop of the 1970’s showcases designer Richard G Jones’s talent superbly. Bravo, Sir. It’s a shame that this almost perfect show did not run without faults – there were a few minor sound balancing errors and transitions which could have been refined a little more, but overall, this show is so feel-good, it’s impossible not to leave without a smile on you face. You’ll find yourself dancing in your seat, toe-tapping and head-bobbing along to the infectiously catchy tunes. Sing hallelujah indeed. This show is fabulous, baby!